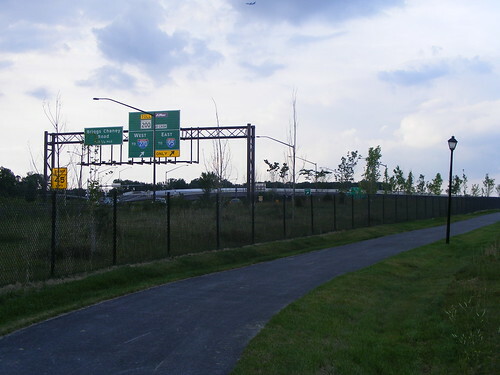 Less than a year old, the InterCounty Connector Trail offers a new way to get across Montgomery County by bike. However, a circuitous route, a lack of connections to surrounding areas and sections with poor visibility all hurt its potential. 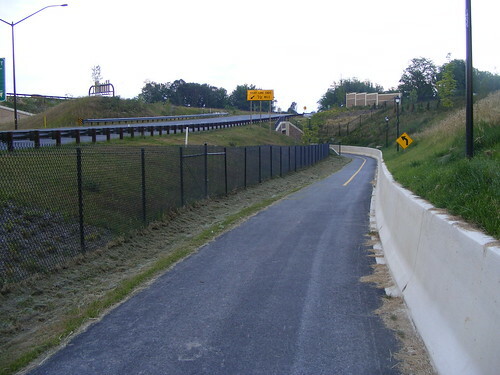 The ICC was originally planned to have a bike trail running parallel to it, but in 2004, the State Highway Administration got rid of it, claiming it would reduce the toll road's construction costs and environmental impacts. 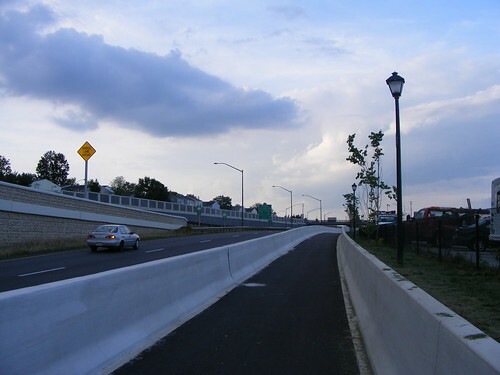 Instead, they gave the ICC Trail a more circuitous and indirect route, running parts of it along the highway and the rest along local roads like Columbia Pike and Briggs Chaney Road. Not surprisingly, area bicyclists were unhappy with the decision. "Why do designers think cyclists should have to go the long way, but cars need a direct route?" asks the WashCycle blog. Part of the trail runs parallel to Columbia Pike between Fairland Road and Briggs Chaney Road in East County. 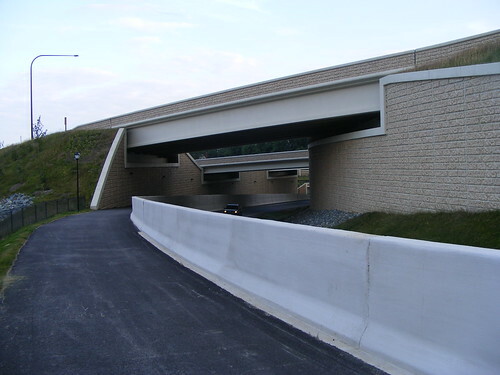 Like the Forest Glen pedestrian bridge that crosses the Beltway, it runs under a highway. The trail is also lightly used and has already been vandalized. This is unfortunate, because the trail could tie neighborhoods on both sides of the ICC together and is a crucial part of a "commuter bikeway" along Columbia Pike first envisioned in master plans 15 years ago. But this part of the ICC Trail won't get any busier or safer without better foot and bike connections to get people to it. Here we are on the trail, just north of Fairland Road. That's the exit sign for the InterCounty Connector up ahead. First we pass this small seating area. People do use it, judging from the abandoned pair of shoes. 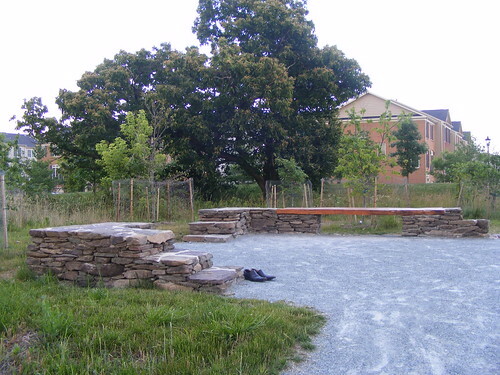 I enjoy the dry stacked stones and wooden bench, which give the trail a woodsy, rustic feel despite its surroundings. Behind the seating area is the recently-built Fairland View subdivision. It's separated by a grass berm and has no connection to the trail, despite being yards away. 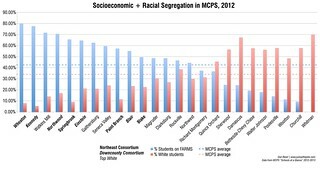 (The view, of course, is of the InterCounty Connector.) I assume these nearby chalk drawings came from kids living there. 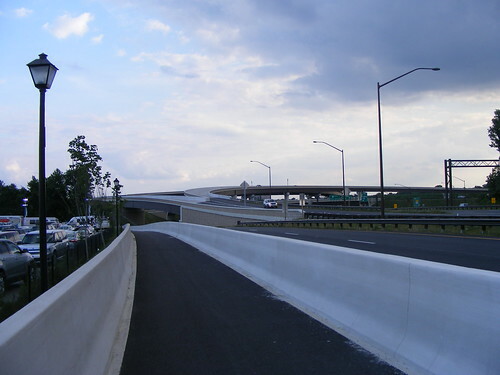 Now we're heading under the interchange between Columbia Pike and the ICC. This part of the trail is almost invisible from either road and the surrounding houses, and I passed a group of young men smoking right before I took this picture. There is Sharpie graffiti in the tunnel, though it's not much worse than anything I saw or did myself in high school. The tunnel appears to have been repainted a few times since it opened; in fact, since I took this photo, the scribbles have already been painted over. It's good to see that the state is maintaining the trail, though I wonder how regularly they patrol it. 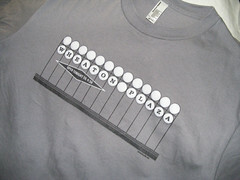 We're now between Columbia Pike on the left, and the Montgomery Auto Park on the right. Turn around and you get a great view of the interchange. 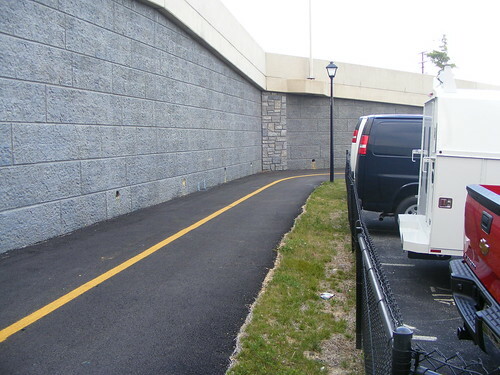 There are maybe waist-high concrete walls on either side of the trail and a chain-link fence separating it from the Auto Park. The wall might keep bicyclists safe from car traffic, but I wonder if it's also there to protect the car dealerships from bicyclists. Across the street is the Briggs Chaney Plaza shopping center; there's a stoplight and intersection in front of us, but no pedestrian signal or even a crosswalk. From here, we can continue down Briggs Chaney, which has a nice, wide shared path for about a mile and a half before connecting to a portion of the trail that's actually on the ICC. Residents of Tanglewood, a subdivision on the south side of the ICC, complained that a trail would invite "criminals" from the apartment complexes along Briggs Chaney Road. While I still think that accusation was unfair, residents' predictions that there would be vandalism on the trail turned out to be true. But as WashCycle points out, the best way to make a safe trail is to make it busy. In the handful of times I've used this one-mile portion of the ICC Trail, I've seen maybe a dozen people there. The trail is new enough that some people haven't heard of it, but it's also obscured by a highway interchange and sound berms. It would've been ideal if the State Highway Administration had laid out the trail first and then worked around it, rather than the other way around. The trail would be more direct, and possibly more visible, while having little or no effect on the ability of drivers to pass through. Check out this slideshow of my bike ride along the ICC Trail and other roads in East County. 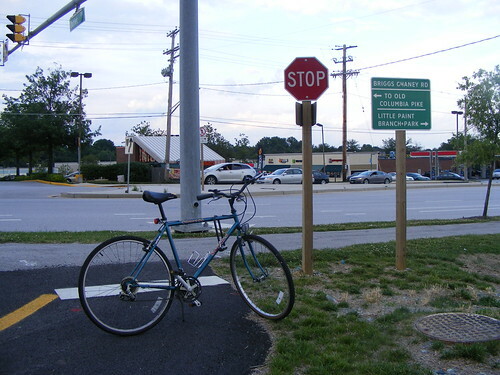 We've ridden on the ICC bike path from Norbeck/28 (at Longmeade) up to where the path ends near Magruder HS. Lovely path, though you have to cross over Georgia Ave and ride through a neighborhood (on a wide, paved sidewalk) for a bit. Round-trip, about 13 miles. Definitely a fun ride, but wish it were longer.